I want to talk about some simple things that even professional photomanipulators don't give enough attention sometimes. Our theme for today is colour of light and shadow. some are better for realistic works, some for surrealism, some for abstraction etc. It depends on your idea. However, today we'll talk about the basic rule that must be followed in any professional work, no matter what your idea is. Why is this mistake is so common in the modern world ?- both photomanipulators and some artists use photo references, the problems come from photos. Unfortunately photography cannot reproduce real colours of life around us – the colours of shadows especially! In the photos all shadows lose natural colours and become grey or turn same color like common lighting (pictures only in warm color scheme or only in cold scheme). Also if the shadows are grey we often tone them the same colour we tone the lighting by mistake. It doesn't matter how many colours you've added to the picture later, if colors of light and shadow are not opposed, your work will make a weird impression. about the colour – main mistakes are using black or grey colour for shadows, same color tones for light and shadow, and missing reflected light in the shadow area of the object. I suppose everyone of you is familiar with the colour wheel. Johannes Itten's colour wheel mostly used by traditional artists, rgb colour wheel suits us better. So, if the lighting is warm: yellow, orange, red, - the shadows should be cold: blue, purple or cyan. On the contrary, if the lighting is cold: cyan, blue etc,- the shadow should be yellow, orange etc. In the picture – a sketch of a ball, we are already familiar with, where we can find the positions of shadows and reflections. Reflected colour (colour reflection) and reflected light without expressed colour characteristics are called reflection. formed by the rays of light reflected from surrounding objects. Drawing reflection as part of chiaroscuro is most important for traditional art. In the picture a and b you can see a smoky semi-transparent green gem, lying on the coloured surface. a) is a wonderful gem, but it's incorrect as reflected light from the surface is missing and no contrast lighting scheme is applied to light-shadow. In the picture b) you can see another one that is more correct. what shadows are opposite to highlights?? That doesn't sound right. I tried it but it looks off. The jump in hue change is huge. It only seems to work for specific colours and lighting. Like warm lighting, cold shadows and cold lighting and warm shadows. Most common that is the only one that turns out right for me is yellow highlight, orange base and blue shadows. Doesn't seem like it should always be followed. If warm is on one side and cool colours on the opposite. What the heck is like a cool red or yellow? or vice versa warm blue and green? I don't get how to choose and reflect colours onto surfaces either. I see artists have warm shadows and warm lighting & cold shadows and cold lighting. But the colours are just usually a small shift randomly around the colour wheel. I'm stuck on greyscale. This is an AMAZING tutorial. I had many years of art but I'm quite rusty and this was a fantastic refresher! A follow-up I would love to see would be one on how to add the right colors (light and shadow) to the gray image you start with. Only 82 comments here? Man, this deserves more! This is gold! This is what I've been searching for for months! always been unhappy with my landscape attempts as the shadows are never "right"
very glad, that this tut is useful! Amazing tutorial Lilia, this explains a lot. Looking forward to try this more consciously in the near future! I've started putting it in practice already. Also reading this very popular color book now, trying to get a whole new feel for the topic. Great! Thank you very very much! Really great!! As a traditional artist sometimes I see beautiful works of digital art, full of creativity and work with mistakes like that, it's a shame. Lights and shadows are difficult to understand and explain, you explained it perfectly! Wow! You opened up my eyes. Awesome tutorial. Very well put together and I appreciate the visual examples. thank you for this great tutorial. i have a solid education background in traditional art and remember the lessons we have about complementary colors and shades. we have used this techniques not just for the shadows outside the objects but also the inside of the objects, for example to color a red apple or a red cherry. i have a bit problems with it in PS to chose the right blending but i'm slowly figuring it out. Thank you, I had no idea shadow worked like this, so this will be a very helpful tutorial for me. A perfectly constructed and useful tutorial! Thank you very much! Thank youuuuuuu The 'wrong' and 'right' examples were fantastic at demonstrating your point. Thank you for posting this! As a self-taught artist I have to constantly remind myself of this when I am doing realistic drawings, especially ones based off of photos. I am getting better about it, but I was guilty of this very thing for a long time. I think it is very common, especially among inexperienced artists. "Colour" is actually correct too. Look it up. wow, this has got to be the most popular tutorial type journal I've ever seen. gran lavoro, grazie per il tempo speso! è anche tutto chiaro! This is marvelous! Wonderfully explained lesson. OH MY GOD JUST THE RIGHT TIME! Thank you so much for this! It's totally helpful! Wow, never thought of shading like that. Very cool. It's kinda funny to remember that not everyone does this by instinct when you're used to automatically doing it yourself...so thank you for telling people about it! Thank you so much,very interesting .I am sure now i am doing it wrong! This is very helpful man, actually taking this as a note thank you , you nailed it. Thanks for the lesson. Very useful and interesting. Reading this really helped me . Thank you for this, your explanations are easy to understand, and your examples help a lot as well ! Thank you for sharing & explaining. Quite helpful. That was very useful. Thank you! Interview with MarcelaBolivarMarcela Bolívar :iconMarcelaBolivar: - one from most original and talented artist of our community has kindly agreed to answer our questions. 1. Could you try to describe the process of realizing your ideas? Do you form the idea clearly at first then search for ways to realize it , or vivid visual metaphors come first, gradually forming the idea, or it happens totally different from all of the mentioned above? deas come at any time to me, that's why I keep always a sketch book near me. I can either make a basic composition or just write down my first thoughts. Interview with Cornacchia-artToday with us very talented artist :iconCornacchia-art:, who has kindly agreed to answer our questions. And for many photomanipulators this information will very precious, interesting and useful. 1. Did you get into the world of photomanipulation as a pro or you had some period of learning? Please tell us about your learning process and about skills in other media (photography, traditional art, handicraft) that helped you to improve? New Contest: Devil in the Details What is this? This is a new contest for members of arcanevault only. But don't worry, anyone can join! For this contest, we will accept all digital media, including photomanipulations. The theme for our group is the arcane: things that are secret, hidden, and mysterious. Our contest theme reflects that overall group theme. The contest theme is: The devil is in the details. for Rebirth. Still life contest to 15 MAY 2016. ♦ Rebirth - Still life. You can represent this theme in many ways, one way is to show a scene that apparently seems is dead, and something charming start to rise, life is born from a death environment. 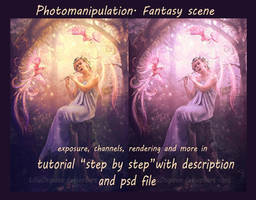 ♦ Create a Manipulation with your own resources. still life in the style do you want. Manip Academy 13: How to make glowing things Hello everybody! Today I'm going to show you how to make glowing things. Light is very important in making photomanipulations, so techniques you will know will be useful. Start from making base at new layer, change blending mode to Color dodge. You can use shape brush (here, dragonflies or stars or anything), or normal soft round brush. Then, duplicate it and change blending mode to Linear dodge (Add). After, for better effect draw with big soft round brush dot over your thing and use Color dodge blending mode. You can duplicate layer with glow or layer with glow and base for better effect. It's important to make good lightning with glowing things. Light isn't strong, but always light up space around. Manip Academy: Creating mood/atmosphere with lightLight is one of my most favourite things to play with when photomanipulating. It is a very useful thing that helps to bring mood to the image and sometimes can even play a role in giving more focus to your subject or whatever you want to highlight. I use it every time, however it's not always obvious, but it makes the difference. Atmospheric light is particularly useful if you want to add detail without overloading your work with different objects. Because it allows you to create highlights and bring out the things you want to, while keeping the rest subtle. It also helps to blend everything in seamlessly and gives the image more depth. I'm going to give out a few tips that help me in playing with this and getting some interesting results. One of the most important things I use in my work is about “Parallelism and Symmetry”. These subjects are related with the order of the elements in a composition, the layout of resources. A parallel and symmetric use of elements in a composition produces and effective transmission to the view; it expresses an easy comprehension of direction. The use of geometric forms to order the elements in your composition is a very good way to make your art effective. You can see the next examples about how I order the resources. Manip Academy 4: Perspective and BlendingPlease note: This lesson is the brainchild of Incantata. It is not my work. I am only sharing with permission. Please direct love, questions, and gratitude to Lilia. Here is a little bit about finding the right size of characters in the perspective of the scene. For example, one of the thousands of my unfinished work "Resurrection." The image below will guide you. 2. Hold the line of the horizon and set the first character, which is built according to the scene. Join in the triangle height of human growth and the point of intersection with the horizon (the green triangle). Now, according to this triangle, we can easily determine the size of the receding figure. Manip Academy 5: Blending Modes and ManipsNote: This Manip Academy tutorial is from LadyEvilArts. It is not my work. Please direct any questions, comments, love, or gratitude her way. Thank you! Few words about most used blending modes (bm), how they affect the image (positive and negative moments). Just select desired bm and check "fill with ... neutral color". Sometimes it's very helpful. Second, when you use blending modes for toning for example, use option "new adjustment layer - solid colour" instead of filling new layer with bucket. Solid color doesn't increase size of your psd file as much as pixel layer does. Manip Academy 1: Depth in the sceneryWelcome to Manip Academy 2.0! The first picture is an example from what we can often see in beginners’ works. This ugly effect is due to 2 mains mistakes: the lack of settings BEFORE the change of light and the use of a single folder (here a blue folder on a multiply mode) to do the change from day to night. This tutorial will show you how to give a natural aspect to this change. By DA's definition, a photo manipulation is a combination of at least two photos to create a whole new image. Often time, photo manipulations can contain 5, 10, 15 or more photos. All of which may come from different sources, meaning different lighting, perspective, color, and quality. The list goes on and on! Stitching all these photos together to make one cohesive composite can seem intimidating, forcing beginners to limit their visions to simple composts the contain just a few images max. While a photo manipulation shouldn't be judged on how many different images it took to create it (If all you need it 2 images then only use 2 images! ), don't limit yourself out of fear of complexity! Let's cover some of the common issues we all run into. How to achieve photorealism in a photomanipulationIf you try to achieve a photo realistic look it`s important to understand some aspects related to photography. And considering the fact that we use photographic elements as a base in our artwork the following tips can also help you find the perfect stock images for your artworks. I have tried to illustrate these aspects using both photographs and photo manipulations. The focus is basically the sharpest area in a photograph. When working with portraits usually the sharpest area is the subject of the image and a small area around it. The rest can appear blurry. This is a great way to make your subject stand out. It's my honor to have a chance to share my tip at Manip Academy here. First of all, I have to tell you that I'm a lazy self-taught digital artist. I know how to use only some simple tools in Photoshop old version (CS3). Besides, English is not my first language. However, I hope this article will be useful somehow at least for beginners and intermediate artists. Last year I held KING KONG AND I contest. And I found that some contestants had trouble to put the woman stocks in their works properly, while they seemed have no any problem with gorillas and backgrounds. Why is that? Hello dear friends :iconsweethugplz: this year I'll talk to you about rain and I'll give you some tips, I hope you find it useful. Manip Academy #13: Grounding in waterHello there! With our earth consisting out of 71% of water I personally like to think that it is very natural to want to place your subject in a lake or river. This can be hard, however, compared to working with lush meadows or deserts since water has its own logic. BUT if you do it right it can definitely give your manipulation a boost! In our case (because most times we already have the body of water from stock photo’s) the only thing we really need to do is merge our subjects into the environment. In this tutorial I am going try to provide you with hopefully some help on how to get your water grounding to look right! A basic tip to start off with: Look at references if you are uncertain how something is supposed to look. What you need to do is to place your favorite fire photos (preferably on dark/black backgrounds) on Screen blending mode. At first sight there's something missing, and that is the dark areas of the fire, which are muted due to our blending mode. Create a new layer between the fire layers and your subject and use the Brush tool with medium Opacity and Flow and black color (a dark brown/orange might work as well, depending on your background and color settings) to bring back the dark parts of the fire. Use the Eraser to get rid of any strokes that go beyond the fire itself. A pen tablet is highly recommended to make this process more accurate. Hey everyone and welcome to Manip Academy #5! I often see artists using external planet resources - which is fine, but I guess what many photomanipulators don't know is that it's actually really easy to create planets in Photoshop yourself! There are many methods to do it, some of them covered in the deviantart tutorial section. The best of all, neither painting skills nor tablet are required! In this quick guide I want to show you how you can create your own planet from scratch with the Photoshop 3D tools. Warning: this tip was written with Photoshop CS5 Extended and Photoshop CC. The procedure might be slightly different in other versions, however, the basic ideas should stay the same. Note: The Photoshop 3D tools are only available in Photoshop CC and the Photoshop CS Extended versions. Manip Academy 2: Soft effects in PhotomanipulationToday's Manip Academy article was written by Cinnamoncandy. I am posting it for her, but the full credit for the tutorial should go to her. Please take a moment to share some love and gratitude on her page! In today’s Manip Academy blog I’m going to teach you how to achieve a softening effect with your photomanipulations. This is a trick that I often use, especially for fantasy and emotional style pieces. NOTE: When I do this technique it is usually my finishing step, so my image is duplicated and my layers are already merged. Step One: Go to Filter>Blur>Gaussian Blur. I usually set the Radius at 3.0 pixels; however, you can adjust it to your liking. Click okay. Step Two: Go to Edit>Fade Gaussian Blur. Set the opacity. Again, you can adjust it to your liking. I often use 25 to 30%. Set the mode to Soft Light. Click OK. I decided to submit a "tutorial" about the journey through a simple landscape manip. Mainly cause I was myself completely lost when I first started doing manips. Going from only knowing painting to trying photo manipulations seemed easy enough but proved very difficult. So these steps are mostly for beginners. When creating a manipulation there will be a lot of different steps, some major, some tiny, don't limit yourself and do not be afraid to experiment and try new things. This tutorial is in no way "complete" but it will go through some steps that I myself had trouble with when i first started learning manipulations. There's many different ways to do things, so I encourage you to try new things to find what fits your unique personal workflow. Step 1. Idea, inspiration, and planning. Hi, folks! In this handy tutorial, we're going to be talking about gradient maps. What are they? How do they work? How can you use them in photomanipulations? See below! What are gradient maps and how do they work? A gradient map is a type of an adjustment layer in Photoshop, which (unlike a traditional gradient fill, which fills an area using a linear or radiant blend of colors) uses the lightness/darkness values in the image as a map for how the colours are applied. This means that you can manipulate each value separately, assigning a different colour to your midtones, shadows, highlights and everything in between. It allows you to change the colour of an object in a much more believable and realistic way than, for example, using the Colour or Hue blending modes. Use of the colour wheel for lighting and shadingI want to talk about some simple things that even professional photomanipulators don't give enough attention sometimes.